Bobby Van's in NYC = One awesome steakhouse!! We were in NYC two weekends ago, and wanted to make sure that we got in one solid New York steakhouse experience. So my wife read all over for reviews, and we settled on Bobby Van's on Broad St. There were six of us that went, and if you don't want to take the time to read this post, I'll just sum it all up by saying it was an amazing culinary experience! First of all, our server was very accommodating. We were a little late for our reservation, but there was no hassle. We conveniently booked on a Saturday evening, and were quite happy to hear that there's a promotion running – half-price bottles of wine on Friday and Saturday nights! So, this got us a nice Chianti with the appetizers and a tasty Shiraz with the entrees. We had the oysters Rockafeller as an appetizer. They were smooth and rich, and served their purpose – gave me more of an appetite! My wife and I shared the massive Porterhouse for the main course. It as simply incredible. Cooked to perfection, bigger than my head, and quite simply one of the best steaks I've ever eaten in my life. The manager was kind enough to give us a tour of the 'vault' (the restaurant is actually in an old bank), and when we came back to our table our server had set out dessert for us. 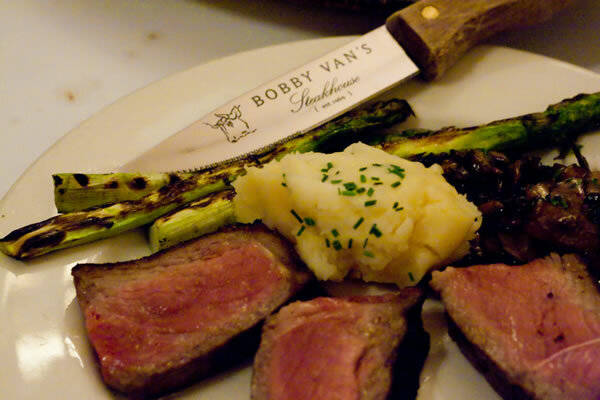 Bobby Van's has won my loyalty – I've made it a goal to eat there every time I'm in New York!